In 2009 The Forestry Commission suggested that the Friends of Bourne Wood might like to use the land adjacent to the wood that was surplus to their requirements for a community orchard. The site is just off Beech Avenue, opposite the Forestry Commission depot. Progress was slow to start with due to discussions about the agreement, but the 15 year lease was signed in 2012 and work commenced. In the Spring of 2012, the first 12 Apple , 3 Crab Apple and 4 Cherry trees were all planted. In addition, a native hedge was planted on 2 sides of the orchard which will hopefully act as a barrier to Deer and Rabbits as well as providing food for birds. The existing hedge was laid by the local Wildlife Trust volunteers. 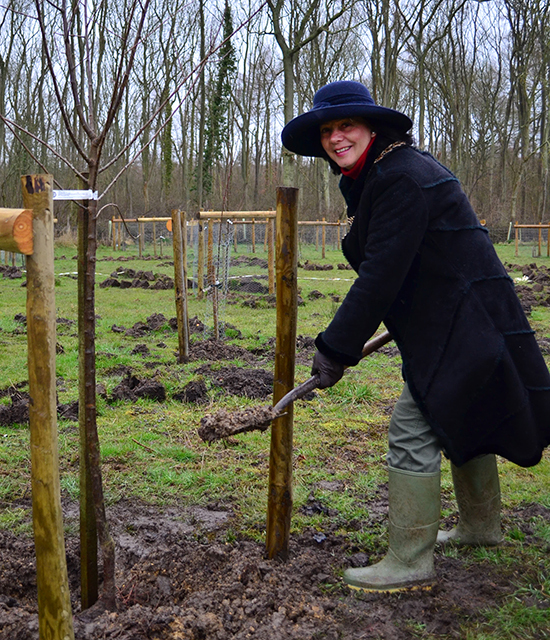 Cllr Helen Powell planting a tree in March 2013 while she was Mayor. 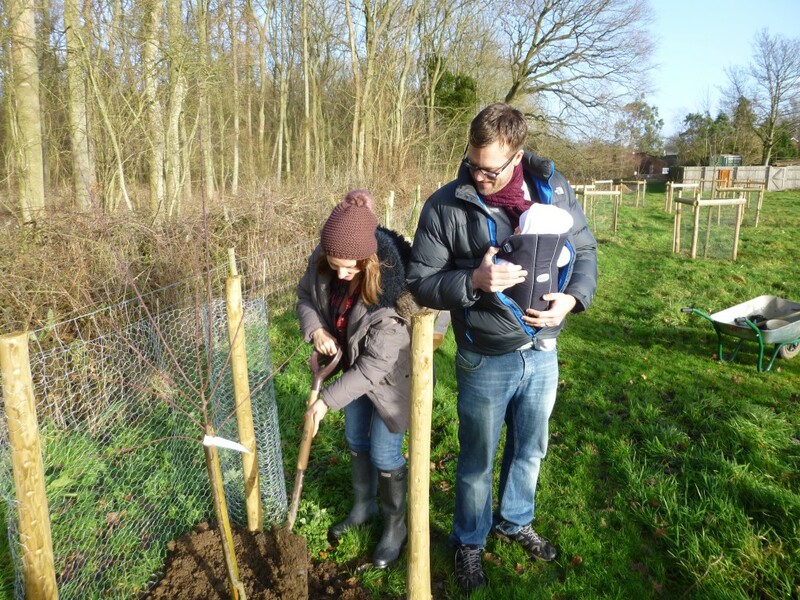 During March 2013 a further 35 trees were planted, all sponsored by local people either in memory of loved ones, for their grandchildren or just for themselves. A further 16 trees were planted in December 2013, and the last few trees have now been reserved. There are just a few espalier trees left to order, as a partition wall between the orchard and the wildlife ranger’s house. The trees selected for planting are a mixture of Apple, Pear, Plum, Cherry, Damson, and Greengage along with a Medlar and Quince, to ensure we have a mixed orchard. The varieties chosen range from old local ones to well-known varieties. In between the trees the grass is left longer, and wildflowers are being planted to encourage insects and therefore provide pollination for the trees. In addition, there are some bee-hives in the corner. A bed of Raspberries has also been included, as an extra interest. Phil and Steph plant a tree for thier baby. The orchard is open on Saturdays and Sundays from 10am to 6pm (dusk If earlier), for quiet enjoyment. There are some benches and picnic tables and all are welcome including children and dogs, but please ensure all litter is taken home. The noticeboard at the beginning of the orchard details the trees and for whom they were purchased. On Saturday mornings there is normally a work party in the orchard from 10am to 12pm if you would like to join us or find out more information. We would like to thank Harrison and Dunn for their continued support with supplies for the orchard and Bakavoor for their donation towards tools.